Who’s tired, overstressed and cranky? 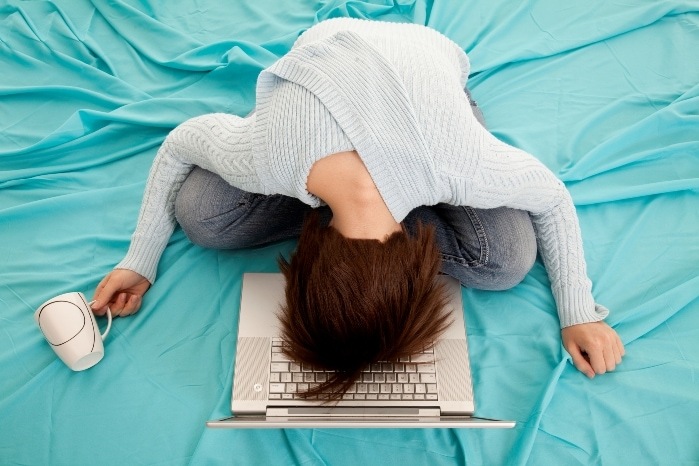 (I’m raising my hand, too…..) If you’re not among the millions of Americans who wish that they could get a better night’s sleep, then you definitely know of someone who is dreaming of sleeping better. 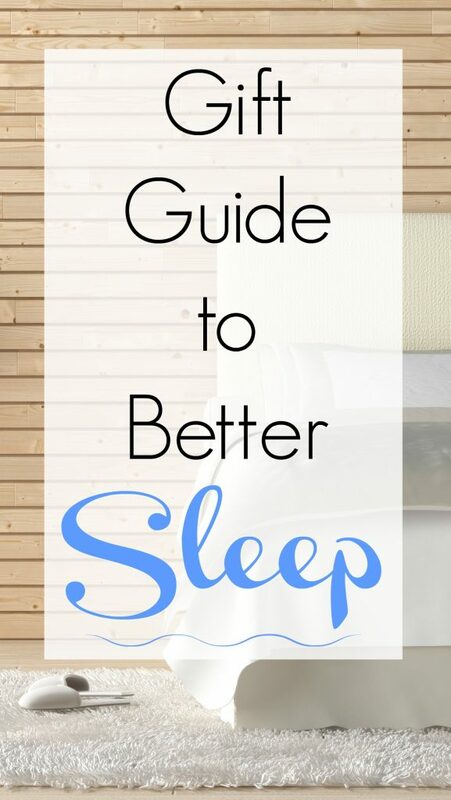 What could be better than improving your sleeping habits? Or giving the gift of better sleep to another overworked, overstressed, overtired adult? 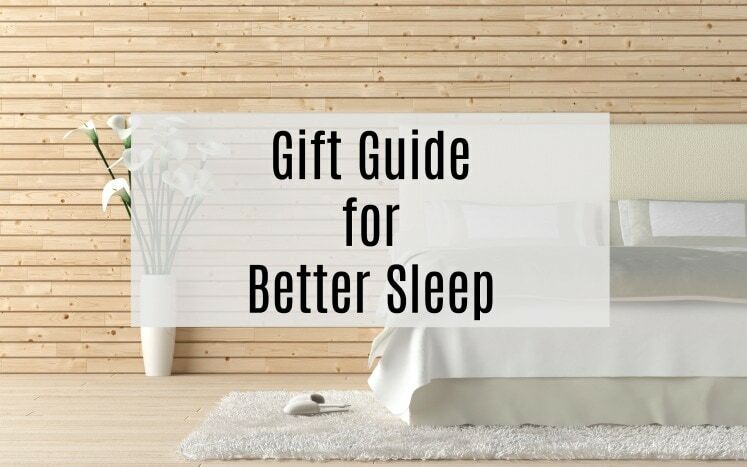 That’s why I curated this Gift Guide to Better Sleep. Any of these products in our guide to better sleep would be a gift to yourself at any time of the year. YOU deserve to be happy and healthy. YOU deserve to make an investment in EVERY. SINGLE. NIGHT. of sleep that you try to get. Our Gift Guide to Better Sleep is also ideal for shopping for that hard to buy person who has everything, or a minimalist gift for someone who wants nothing. Everyone sleeps. Everyone. Gifting a product that helps you sleep better is welcomed by anyone, no matter their age, profession, relationship to you, income level, etc. The Gift of Better Sleep is universally appreciated. Disclosure: Sleep is subjective to everyone (and often impacted by medical conditions). And I am not a medical professional. These are simply the tools and gadgets that I have used or suggest that have resulted in better sleep. Could a new light bulb be the answer to better sleep? Maybe! 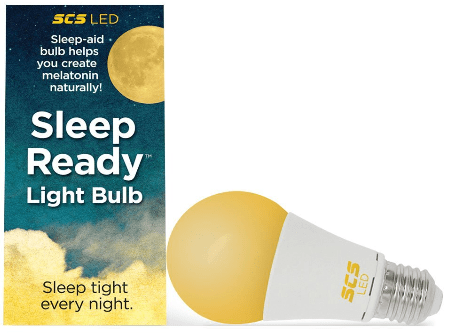 These special light bulbs filter out the blue light waves that mess with your melatonin levels. What’s melatonin? It’s the body’s hormone that helps with your circadian rhythm and drifting off to sleep. So you can still read in bed, crochet at night or simply not sit in the dark – all while allowing your body to do its thing naturally without the interference of sleep-reducing blue waves. Maybe you don’t want an entire room lit up. Or perhaps you like reading in bed, but your partner wants a dark room to sleep in. 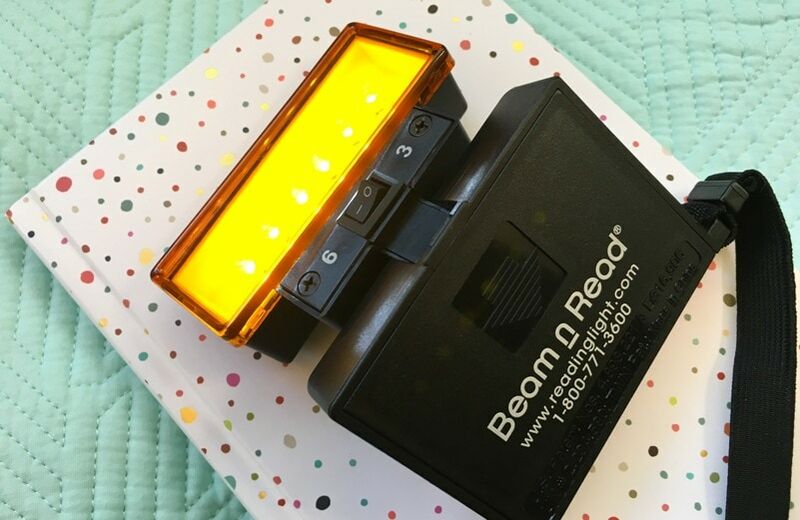 Or, if your favorite hobby is crochet, quilting, needlepoint or crossword puzzles, you probably want targeted light on what you’re working on so that you can see. 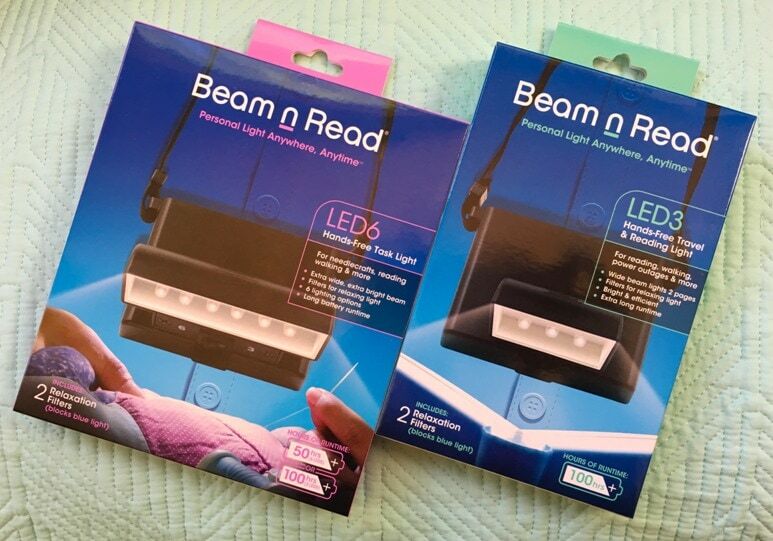 These personal lights from Beam n Read are great! They come in two different sizes (with either 3 or 6 LEDs). Each hands-free light comes with a cord that hangs around your neck to give you targeted light at night. The LED lights can even be powered by a USB cord, so you don’t have to keep changing out batteries. The best part of these mobility lights is that they come with blue light blocking filters – orange and red filter attachments that you can put on the light to reduce blue light at night. Which means you can read or craft or even walk the dog with a light that won’t stimulate your brain to stay awake at night. Need a night light to help you see your way to the bathroom or help a child get to sleep? Salt lamps impart a gentle orange light that is comforting without blue light to alter sleep. 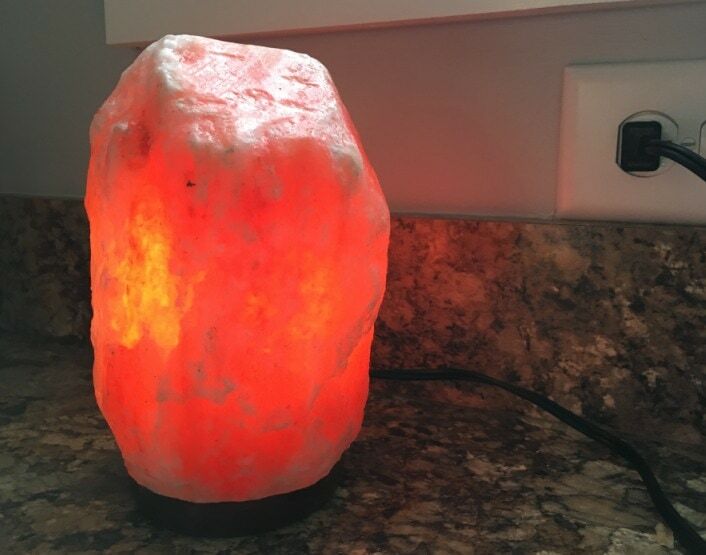 Salt lamps are said to give off negative ions, too, which can combat the positive ions coming off of electronics in your home. Okay, this thing is cool. Especially if you’re prone to hot flashes in the middle of the night or you sleep hot at night. 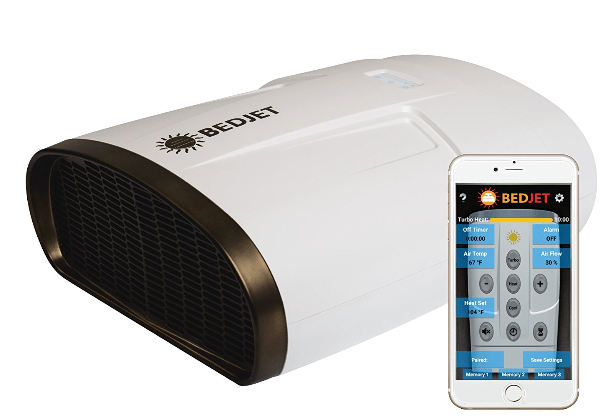 Think of the BedJet as a personal air conditioner or fan for your bed. Yet when the weather turns cold, the BedJet is also a personal heater for your bed. Better sleep is definitely easier when you can program the perfect temperature for sleeping. The device can be located underneath most mattresses, with a cooling tube that comes up between the sheets – ANY sheets of your choosing. You control the temperature, how long it runs, and all kinds of personal sleep preferences. The reviews speak for themselves. Seriously, check out how many awesome reviews the BedJet has! Whether you’re in the city and want some more peace and quiet – or you’re in the country and need some amount of noise – everyone’s perfect amount of ambient noise for perfect sleep is different. There’s no one right answer. What is almost universally annoying, though, is the sound of people coughing through the walls, snoring, a party going on next door, sirens, etc. A great sound machine or other sound masking device can blur annoying sounds and let you focus on more soothing sounds. When I’m traveling, I use the free White Noise app on my iPhone. It’s a great app with a lot of different ambient sounds to mask loud noises from hotel rooms, etc. It’s available on both mobile and desktop. I’m not a big fan of having a mobile phone by my head while sleeping, though, due to concerns about electronic emissions. That’s why I prefer using a sound machine that can be used anywhere within a room, even far from your bed. 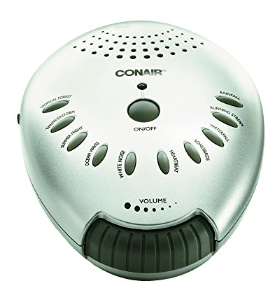 I’ve been using the Conair Sound Therapy Sound Machine for many years now and have been happy with it. Yet I’ve noticed that the reviews aren’t nearly as great as other sound machines, such as Big Red Rooster and HoMedics Sound Spa. What I like about all of these is that they can be plugged in or run on batteries. 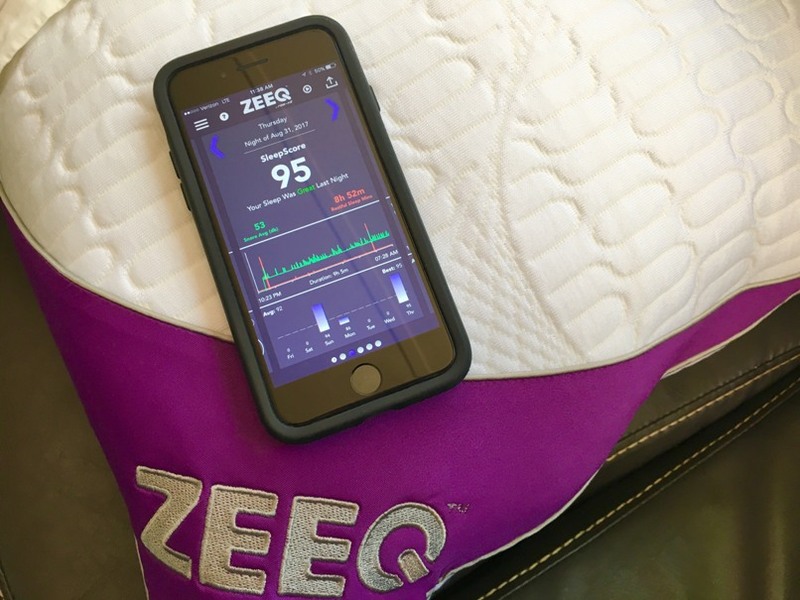 When we heard what the ZEEQ by REM-Fit Smart Pillow did to promote better sleep, we were kind of skeptical. Yet after using it, we’ll agree that this pillow is kind of amazing! It’s my husband’s new favorite pillow, and my sister really wants one now, too. With embedded technology that plays music or other audio through speakers inside the pillow, you can easily drift off to sleep without disturbing your partner. Set the timer so that the music from your phone turns off at a set time. You can also schedule a wake-up alarm that can only be heard through your pillow. So you won’t wake up your partner. That’s pretty cool. 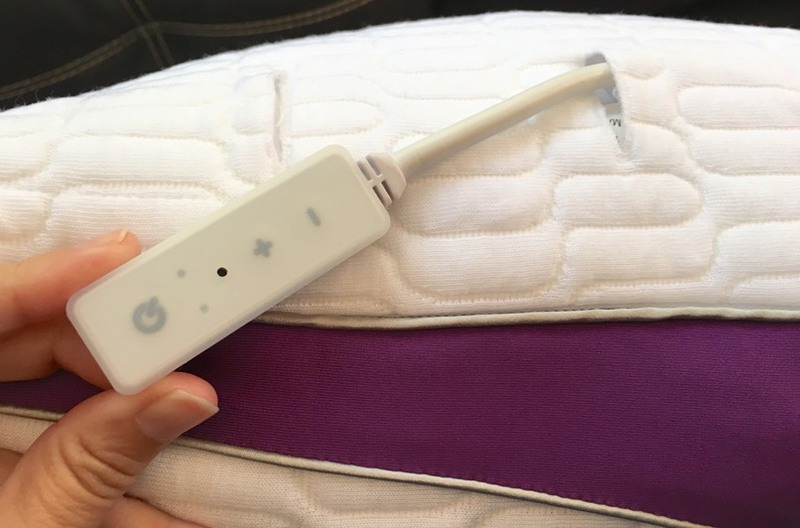 Also super cool about this smart pillow is that it can help you track sleep problems. That’s right, you can actually get a sleep analysis and real data about how often you toss and turn so that you know what’s going on in your sleep. A gyroscope located deep inside the pillow (you won’t feel it) can actually tell you the next morning how often you tossed and turned. For snorers, the pillow can be programmed to automatically start vibrating when you’re snoring over a certain decibel level. Which is a brilliant solution for when you’re snoring keeps your partner up at night. My husband (who is notorious for going through pillows like crazy because he hates them all) loves this pillow. He raves about how soft yet firm it is. That’s a win! 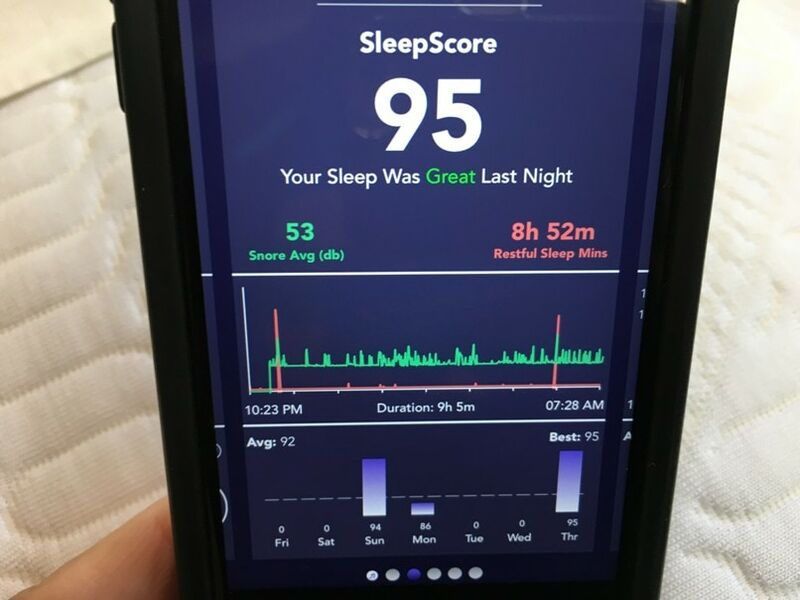 So definitely a great review for ZEEQ REM-Fit pillow with at-home sleep analysis. Prepare your bed for sleep time with this natural Sleep Pillow Mist Spray. Made with essential oils and organic witch hazel, it’s a great stocking stuffer. 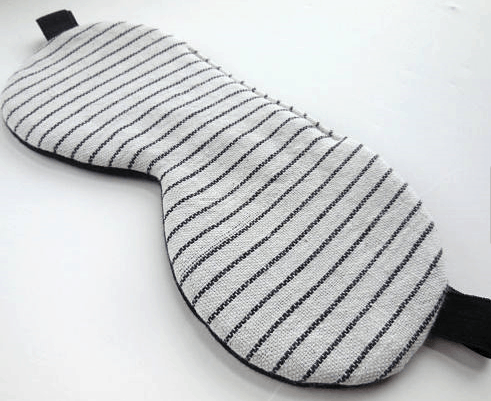 An eye mask blocks out light when you can’t control your environment. If you can’t put up light blocking shades, or if your partner likes to read at night, an eye mask is a MUST to block out bright light that can prevent sleep. There are a lot of eye masks out there, but I like this one made of organic materials to keep against your skin at night. It’s perfect for both men and women. 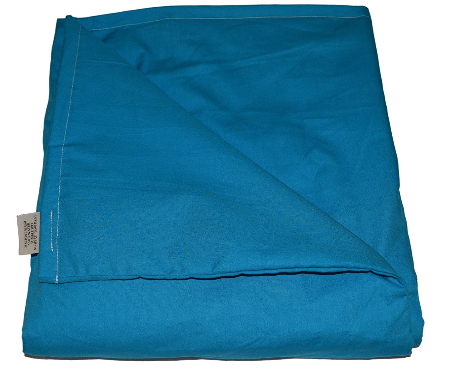 I had never heard of weighted blankets before I found them on a search online. I haven’t used one myself, but I’m intrigued by their use. What is a weighted blanket? It looks like a normal bed blanket, but it’s got tiny glass beads spread throughout the blanket. The small amount of evenly distributed weight is said to help with sensory and sleeping issues by applying gentle pressure to the body. This organic one is available in a variety of colors and sizes, and with a money-back guarantee, it’s a better sleep product that’s worth trying. No one wants to wake up hot in the middle of the night. Yet so many people do. Better sleep can be found through temperature regulation while sleeping, which means keeping your body cool when it starts to heat up, and keeping your body warm when temperatures drop. Natural fibers, especially wool, are ideal for smart temperature control. Check out this Etsy shop with so many sleepwear options in a variety of natural materials that are all modern and stylish. I have not been shy telling everyone how much I love this mattress topper (I’m using it in my RV, hence the video title below). It’s the one that I use, and I’d buy it again and again. It comes rolled up in a box so that you can still wrap it up as a gift if you want. It’s so good that I wouldn’t wait for anyone else to buy it for me. Go ahead and gift it to yourself right now for better sleep. If you’re looking for a grand gift to better sleep, there’s nothing better than a brand new mattress. This is the one that I love. I rave about it over and over again. I am not sleeping on this mattress right now because I’m living in an RV (and using the mattress topper above as my bedding) but boy, do I miss this luxurious mattress at an affordable price for natural bedding. I understand on not sleeping good and tossing back and forth. Waking up in the middle of the night, or even in the morning hurting cause the bed is old and the pillows are not very supportive. The cost of a GREAT new bed & pillows are so expensive. These are such amazing inventions that I have never heard of, great posts! Thanks for sharing?